Today I got my first look at what will be our hometown for the next few years at least. Well, to be strictly accurate, today I saw our hometown (Suginami city) and the nearest “bright lights” district, Kichijoji. And I must say, it’s an interesting spot. Kichijoji is situated on the western side of Tokyo about 10 minutes on the train from Shinjuku and about 15 minutes from Shibuya. This makes it quite suburban by Tokyo standards, but it is anything but a sleepy dormitory town. 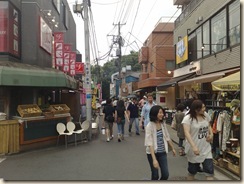 Kichijoji is absolutely ram-packed with shops,restaurants, bars – you name it – all tucked away in a rabbit warren of side streets and little alleys. Big M says she has been coming here for the best part of 20 years and still hasn’t seen it all, and I can believe it. I think it would take a lifetime to find everything that’s on offer here. 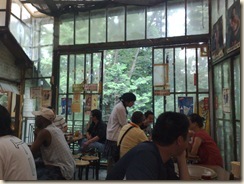 The most interesting part for me is Inokashira Park. We didn’t quite make it into the park today, but we got as far as a yakitori restaurant that sits alongside it. It’s called Iseya and apparently is a bit of an institution. Once inside the dark, smoky and incredibly hot interior, it becomes clear that the building is actually a series of yakitori shacks that have somehow grown together over the years. This is the only way to experience yakitori – unsanitised, earthy,organic and all the more tasty for it. While we were inside, a Summer storm brewed up – kicked off by the fierce heat and humidity. As we sweltered inside, the wind rattled against the plastic sheet nailed clumsily over the rough wooden window frames and tugged at the grimy perspex roof. Nestled against the edge of the park, this ramshackle old building suddenly seemed light years away from the modern neon-bright concrete Tokyo. I really enjoy finding these old, hidden places. And it seems Kichijoji may well have many other treasures to reveal. I’m going to enjoy finding them.